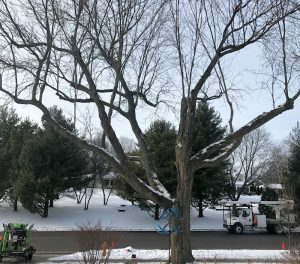 Why is winter your absolute best time to trim or remove dead trees? YES! This is the absolute best time for your landscape and your budget to have your trees trimmed or removed!! Our cold temperatures makes for a cold hard ground. There are no leaves. The trees have 30% less material on them right now. It is easier to work on them, plus it is easier to see to prune to their correct structure. We have very specialized aerial equipment that minimizes landscape access and makes performing tree work both safe and efficient. This equipment is as light as a small pick up truck. It is self propelled and on wide turf tires that is capable of going through snow. Have a fenced in yard and absolutely no equipment access? We are also capable of hand climbing your trees. The best rates available for having tree related projects done on a budget is to hire us to only do the aerial work. You can certainly pay us to chip brush, haul away wood, or rake-up. Our overhead to do that though is much higher than say a landscape or lawn care company or the neighborhood guy with a pick up and trailer. We’d rather use the limited window of time to get as much aerial tree work done as possible. If you’re capable of hauling or burning brush or giving wood away or using it, you can save at least half of the normal cost to have a tree service staff deal with the brush, wood, and rake-up. We can come in and do the aerial tree work needed. You can wait for the snow to melt and clean it up in the spring. You could even hire a landscape or lawn care company or advertise a debris removal gig on craigslist. Spring storms are right around the corner – save on damage from falling limbs. Sum it all up and I think you will agree! The ground is hard; your landscape and lawns wont incur as much damage. Lower costs; Idle crews and equipment costs me money. Savings are passed on to you. Prevent Oak Wilt from spreading; deadline is approaching. Emerald Ash Borer is dormant; removal now helps prolong the life of healthy ash trees.